The Delaware News-Journal reported last week that AAA Mid-Atlantic has asked state garages for details about their labor rates and operations in a way that ought to sound familiar to the auto body industry. 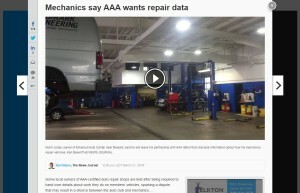 In this case, mechanics in what’s essentially AAA’s 15-shop roadside-assistance direct repair program are worried that AAA will use the data to undercut them with a AAA mechanical shop the insurer plans for Brandywine Hundred, Del., and its $1.6 million facility in Dover, Del., according to the News Journal. AAA tried it before, but the mechanics rejected the idea (“They can see what our revenues are, they can see what our cost mark-ups are,” one told the newspaper), according the the News Journal. (AAA spokesman Jim Lardear) said the information about repairs will help the auto-club monitor the quality of work being done on its members’ vehicles and will help AAA researchers find patterns about chronic vehicles problems, which would allow the company to more efficiently respond to roadside assistance calls, he said. Another representative told the newspaper the shops would just be hurting themselves by losing the AAA seal of approval. What’s interesting here is that the mechanics (and media) might be missing another long-term consideration of this disclosure, based on the experience of the collision repair industry and allegations in some body shops’ lawsuits. Insurers really haven’t cracked down on mechanical repair the way they have with collision repair. That’s probably because so much of it is out-of-pocket, and underwriters have less of an interest in or control over it than they do for the 70-odd percent of collision repair business involving a policyholder. But AAA and its peers have roadside assistance programs requiring mechanical labor, and sometimes, they must also contract out for mechanical repair during a collision if a body shop doesn’t offer it. That mechanical work comes in at rates far higher than collision or refinishing work. In 2015, average hourly mechanical rates in collision estimates tracked by CCC was $80.48, compared to $47.31 for sheet metal body labor, $54.21 for frame labor and $47.22 for paint labor. Mechanical labor rose 2.9 percent, compared to 1.6 percent for frame labor and 1.3 percent each for the sheet metal and paint labor. CCC doesn’t track what percentage of repairs are sublet and what percentage are done in-house, but an average of 0.6 hours per appraisal are done at the mechanical rate, and 14.73 percent of all appraisals include mechanical labor, according to lead industry analyst Susanna Gotsch. “Newer vehicles had more labor time at mechanical rate; as did Collision loss category losses (i.e. more front end hits),” she wrote in an email Wednesday. It’s probably worth considering by the mechanical repair industry that insurers would want to take a harder look at their costs in a time of technological disruption and higher frequency. A few tenths of a point of combined ratio can give an underwriter an edge or free up more income for investments. One could see the appeal to an insurer of having a DRP auto body network subcontracting to a DRP mechanical repair network like AAA’s. 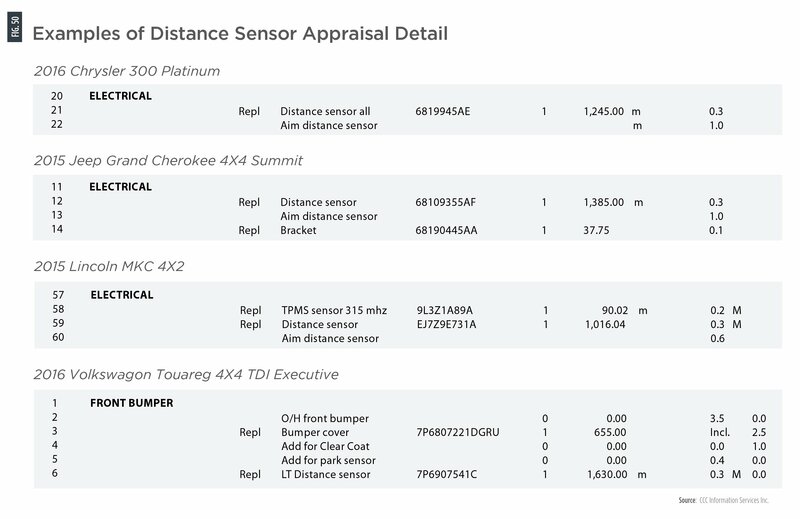 Such costs might command even more attention as insurers and collision repairers encounter younger and younger vehicles more likely to need two scans (pre- and post-repair) and some form of calibration. If a body shop is unequipped to perform that work, they’ll have to farm it out to a mechanic or risk everything from airbags to autobraking being compromised. For example, CCC noted that in 2015, module code-clearing work related to crash-avoidance systems was being billed with mechanical rates. “The database will flag each part and its ‘add if required’ operations such as ‘Add for distance sensor’ or ‘Aim distance sensor’ are also identified as mechanical components – each will be flagged in the estimate with an ‘m,'” she continued.